The Mosquito Indians first came into contact with the English when the Earl of Warwick established his colony at Providence Island in 1639, off the Central American Coast. He persuaded their King to send his son to England. This prince, known to his descendants as Oldman (or Oldham in old documents), was received in audience by King Charles I, who invested him with a hat of state and some instruments of insignia. He returned to the Mosquito Coast to find that his father had died during his absence, and that he was now King. His son and successor, Jeremy, visited Jamaica in February 1688 and placed himself and his people under English protection. Thereafter, all his successors were confirmed in their successions by virtue of a certificate of recognition from the Governor of Jamaica. In the years that followed, small numbers of English and American settlers, escaped convicts and slaves, settled in several centres along the coast. Many of them intermarrying with the local tribes of Indians and leaving offspring who took part in the military and administrative affairs of the Mosquito kingdom. Relations between the Mosquitos and the Spanish had always been poor, but the increasing number of settlers increased tensions further. English commercial interest in hardwood logging in nearby Honduras exacerbated Spanish antagonism and apprehensions. Consequently, official British involvement in the region steadily increased. The Mosquito King and the British concluded a formal Treaty of Friendship and Alliance in 1740, followed by the appointment of a British Superintendent resident on the coast in 1749. His brief included the establishment of a more formal protectorate over the Mosquito nation, advising the King, codifying the laws and formalising a system of land grants. The Mosquito’s were especially useful to the British during the American Revolutionary Wars. They attacked and harried the Spanish, who were then in league with the revolutionaries, and gained several significant victories alongside the regular British Forces. However, at the conclusion of the peace in 1783, the Britain had to relinquish control over the coast. Formal withdrawal was completed at the end of June 1787. Despite this withdrawal, Britain maintained an unofficial protectorate over the kingdom, often intervening to protect Mosquito interest against Spanish encroachments. Relations were always close, with a number of British advisers, teachers and missionaries continuing to serve on the coast. Several members of the Royal family received their education either in Jamaica, British Honduras, or England. Several kings were crowned according to Anglican rites at the Cathedral in Belize. From the middle of the nineteenth century onwards, British interest in the region began to wane. The Spanish had long since left the region and the old antagonisms between the rival colonial powers had evaporated. However, the former Spanish colonies which eventually became the republics of Nicaragua and Honduras, continued to the old practice of encroaching on the Mosquito territories. Britain intervened less frequently, and negotiated away its rights in successive treaties with the new states. The northern parts of the kingdom, including the former British colony in the Bay of Islands, were recognised as Honduran territory. Nicaraguan sovereignty was conceded over the principal portion of the Mosquito Coast, though with some important continuing British guarantees, by the Treaty of Managua of 28th January 1860. Thereafter, the consecrated King, George Augustus Frederic II, ceased to be recognised as a sovereign, merely a “Chief” and his kingdom transformed into the “Mosquito Reservation”. The rest of the nineteenth century simply saw the Mosquito Nation quietly strangled out of existence. In 1894 the Nicaraguans intervened on the pretext of a border dispute with Honduras, drove the young king out of his domains and extinguished his realm, then renamed the area the Department of Zelaya. He escaped aboard a British warship to Jamaica, where, in consideration of the old alliance, he received a government pension for the rest of his life. He died after an operation at the Kingston General Hospital, aged 34, and leaving an only daughter, who later settled in Belize. 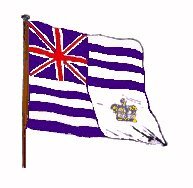 Great Britain acknowledged the full sovereignty of Nicaragua by a treaty concluded on 19th April 1905. It should be noted that there is some nonsense written about the Mosquito country being divided between three distinct authorities in three distinct regions under a hereditary Admiral, hereditary Governor, and a hereditary General, who shared power alongside the King. From this, some scholars have gone on to develop elaborate explanations and theories of Mosquito government, administration, ethnicity and tribal affiliation. In fact, these titles were conferred by commission on several senior officials by the Mosquito King, and were not restricted to either three individuals at any one time or to particular families. This is made obvious in the list of local representatives who attended and took part in the oath of submission at Woollang on 14th November 1815. They include among their number, one Governor (of Tobapec), three Generals, three Admirals, two Colonels, two Majors (all the former being also commandants of districts), and twenty-one Captains. The status of these individuals being little different from officers enjoying the same ranks in any other monarchy, and suggests a more organized military and administrative structure than some writers would have us believe. The sovereign: By the Grace of God King of the Mosquito Nation, with the style of His Majesty. The principal wife of the sovereign: Queen, with the style of Her Majesty. The Heir Apparent: Hereditary Prince (given names), with the style of His Royal Highness. The other sons of the sovereign: Prince (given names), with the style of His Highness. The daughters of the sovereign: Princess (given names), with the style of Her Highness. The eldest son of the reigning King. In the absence of sons, election by the Council of State from amongst the closest male blood relatives of the deceased ruler. 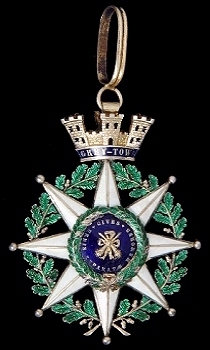 The Order of Grey Town - Grand Commander, breast star (L) and Commander, neck badge (R). Coronation Medal: instituted by King George Augustus Frederick to mark his Coronation at Belize on 12th May 1845. 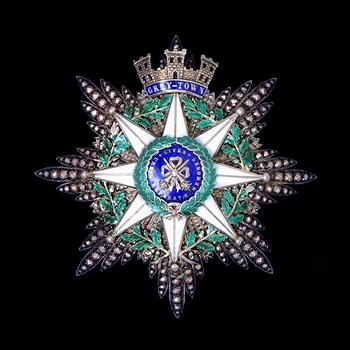 Awarded to Mosquito chiefs and noblemen and to military officers, both British and Mosquito, who took part in the ceremonies. Known only to be a circular silver medal, of which no extant example or illustration has surfaced. Aug. Brindeau. A Histoire de la Mission Morave a la Cote des Mosquitos (Nicaragua) de 1849 а1921. Imprimerie Centrale Ch. Hillier, Strasbourg, 1922. “Correspondence respecting the Mosquito Territory”, British and Foreign State Papers. 1849-1850, Vol XXXVIII, pp 641-795. The Librarian and Keeper of the Papers, The Foreign Office, London, 1862. George King of the Mosquito Shore to Lord Dartmouth - his brother and nephew will personally lay before Lord Dartmouth the grievances of the people of Mosquito Shore. 15th October 1774, Sandy Bay, Mosquito Shore. Document ref. no. D(W)1778/V/307, Staffordshire and Stoke-on-Trent Archive Service, Staffordshire Record Office. Dr. John Holm. “Mosqitia’s King Jaaj Kraas”, The Flag Bulettetin. XVIII, No 2. The Flag Research Center, Winchester, Mass., USA, 1979. The Honduras Almanack, For the Year of Our Lord 1826, 1827, 1829 and 1830. Printed by Authority of the Legislative Assembly, Belize 1826-1830. Isaac, Duke of Boccaterra, to Lord Dartmouth complaining of enslaving of Indians of neighbouring tribes, 20th March 1775, Sutton House. Document ref. no. D(W)1778/V/308, Staffordshire and Stoke-on-Trent Archive Service, Staffordshire Record Office. Robert N. Keely, Jr., MD. “Nicaragua and the Mosquito Coast”. The Popular Science Monthly, 1894, No 45 pp 160-174. Picture of King I 1893 from here. Sir Harry Luke, KCMG. Caribbean Circuit. Ivor Nicholson & Watson Ltd., London, 1950. Mosquito, Nicaragua, and Costa Rica. Second Edition. Effingham Wilson, Royal Exchange, London, 1849. M. D. Olien. “The Miskito Kings and the Line of Succession”. Journal of Anthropological Research. 1983. Vol 39, pp 198-241. University of New Mexico, Albuquerque, New Mexico. M. D. Olien. “Micro/Macro-Level Linkages: Regional Political Structures on the Mosquito Coast, 1845-1864”. Ethnohistory. 1987. Vol 43, pp 256-287. M. D. Olien. “Imperialism, Ethnogenesis and Marginality: Ethnicity and Politics on the Mosquito Coast, 1845-1864”. The Journal of Ethnic Studies. 1988. Vol 16, pp 1-29. Western Washington University, Bellingham, Washington, USA. Bedford Pim and Berthold Seemann. Dottings on the roadside, in Panama, Nicaragua, and Mosquito. Chapman & Hall, London, 1869. Orlando W. Roberts. Narratives of voyages and excursions on the east coast and in the interior of Central America. Constable & Co, Edinburgh, 1827. Sorsby, W. S., 1969, The British Superintendency of the Mosquito Shore, 1749-1787. Ph.D. diss., London: University of London.